Electric shock occurs when a person is exposed or touched an electrical outlet. Electrical current flow through the body (the human body is a conductor of electricity) could potentially cause harm such as thermal burns, injuries to muscles or internal organs and disturbance of the heart function which can lead to shock (cardiogenic shock). A lightning injury can also be defined as splashes of higher electric power in a very short period of time. In terms of physics, the effects of lightning spark cannot be compared with electricity generated for use in home or industry. Moreover, discussions on both topics will be focused on the effects of medical aspects only. 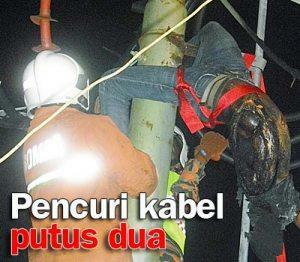 There is no exact statistic regarding the yearly incidence of electrical or lightning injuries and death in Malaysia. Many stories about electric shock or lightning revealed through news releases, especially about the accident that occurred at the workplace or accident involving electrical cable damage. There were 1000 death caused by electrical shock in United State of America and the mortality rate up to 3-5%. The accidents in the homes were the result of carrying out illegal wiring and use of unapproved and low quality electrical equipment. Most accidents at power utility installations involving the public were due to intrusions or lack of knowledge and awareness about the dangers of carrying out activities around the prohibited area. Accidents involving teenagers occur because of their curiosity and risky activities that expose themselves to the electric shock incident. Meanwhile, babies and small children are exposed to an electrical source in the house as they think of electrical equipment as a toys or material for consumption (bite). The flow of electricity in human body (if the flow of electricity pass through the heart, the risk of death is very high). Electrical shock victim may not show obvious sign and symptoms of external injury. There is a patient who found unconscious after electrical shock because injury to the nervous system and heart (cardiac arrhythmia). 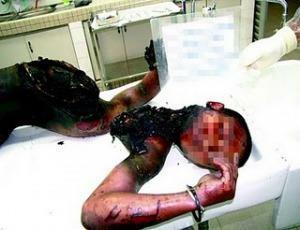 The most severe burns are located at the exposed body area to the electrical sources. Other than external injury, muscle contraction may occur and may lead to cervical spine injury and internal organ damage. Deformity of the victim’s body may due to skeletal fracture.Severity of the body injury is depending on the power of electrical source. Higher voltage (500-1000 volts) will cause body injury by internal heat process. A lot of victims died due to burns wound compare to electrical effect itself. Normal electrical power supply (AC electrical current) for home usage in Malaysia is 240 volts with a rate of 50Hz. If the electrical shock occur over the chest, it will affect the heart by induce abnormal myocardial contraction which lead to heart attack (ventricular fibrillation). Meanwhile, 300 to 500mA DC electrical current could cause heart attack. Patient will die from heart attack if not treated immediately. Electrical current could disturb neurological function of the brain, heart and lung. It will cause neuronal damage or neuropathy. Electrical current that pass through the brain may lead to unconsciousness. Meanwhile, electrical current that pass through the heart may cause heart attack as exolain before. Arc flash from electrical shock or lightning had a high energy of heat. This arc flash may cause severe burn to the human body. Electrical shock from electrical conductor from the lightning such as house telephone cable and metal component to protect from rain. Electrical shock from lightning that passes through the earth. Direct injury from side effect of lightning to the nearest object. Injury from flying object and barotrauma produce by lightning thud. The majority of injuries are caused by the impact of barotraumas to the environment such as tree branch and other objects nearby. Direct injury from the lightning or injuries caused by internal burn are rare. Death usually caused by the effect of electrical shock from lightning to the heart system or neurological system. Muscle-severe muscular cell death need to do a surgery to remove all dead tissue till the level of amputation. Internal organ- depend on the organ involve. Involvement of internal organ usually cause by high voltage electrical shock and cause death. Heart- the victims will die if the heart attack is not treated immediately. Nervous system- brain injury from electrical shock can cause permanent neurological damage and patient may had paralysis, seizures or personality disturbance. Low voltage electric shock with short period of time usually does not cause harm or just only cause minimal wound that can be treated at home. However, if home treatment is not successful, please get further advice and treatment from the medical personnel. Meanwhile, the victim should be bringing to hospital for high voltage electrical shock with serious injuries to the body such as burn because further management should be done to the victims. For pregnant lady who had electric shock must be send to hospital for further assessment and treatment. All high voltage electrical shock cases (above 500 volts) should have treatment in emergency department in hospital. History loss of consciousness after electric shock. Any problem with numbness, cramp, paralysis/weakness of the movement, sight, hearing or slurred speech. All pregnant lady above 20 weeks period of gestation. Initial assessment will be focus on injury to the internal organ, musculoskeletal system, heart and nervous system. These tests will be done by medical officer based on mechanism of injury and physical examination finding. Full blood count test to identify sign of haemoconcentration, infection or low level of haemoglobin because of bleeding. Urine test (UFEME) for detection of myoglobinuria suggestive of serious injury to muscle. X-ray to look for any skeletal fractures. CT scan if needed to look for internal organ injury especially unconscious patient after electric shock to look for brain injury. Switch off the electrical equipment or switch off main power supply at home or office. Dial 999 to get help for ambulance and paramedic. If power supply cannot be switch off, used insulated object like dry woods or dry rubber to push victims away from electrical source. Stand over the insulated object and do not try to help victim if it is involve high voltage of electrical supply. NEVER touch the person receiving the electric shock, or you could suffer one too. Once patient are removed from electrical source, please assess patient for sign of life e.g. movement, breathing or pulse. If there is no sign of life, please proceed with CPR if you are trained to do so. If patient had burn injury, please remove their cloth and stream a normal water to the burn wound until pain was releive. Give emergency treatment for burn wound as usual. Stay with the victims until ambulance arrive. If the victim had a trauma because of thud from electric shock area, please don’t move patient’s neck to avoid further cervical injury which can lead to spinal cord injury. Give immediate emergency treatment for wound and fracture as usual. Don’t get closed to the high voltage electric shock victims until main power is switch off or there is a risk of explosion. Don’t apply any substance like ice, butter, oil or any dressing that attach to the burn wound. Don’t remove the dead skin or break the bullae. Don’t touch the victim’s skin if electrical shock is still ongoing. Treatment will be given based on severity of burns wound and also side injury. Minor: treat with antibiotic cream and dressing. More severe injury may need surgical intervention to remove dead tissue and follow by skin grafting later. Serious injury to the arm, leg or hand occasionally may need surgical intervention to remove dead muscle tissue or amputation if needed. Eye’s injury need to be check and treat by ophthalmologist. Fracture injury need to be refer to orthopaedic surgeon for surgical intervention after splinting and immobilization. Internal organ injury should be observe in the ward or may need surgical intervention. Children below 12 years old: Most electrical shock occurs because of equipment or electrical cable damage. Make sure electrical equipments and cable are monitored for any damage and should be repair or change if needed. Don’t allow children play with the electrical cable and socket. Limit the usage of additional electrical socket base on electrical equipment instruction. Change the old cable and socket with grounded 3 pronged systems. Avoid electrical cable extension at the web area (sink, bathroom) or please get professional advice if the extension is needed. Children above 12 years old: Most of cases occur because of high risk activity and curiosity among the teenager. Incident involving teenager associate with trespassing activity to the high voltage power system TNB or high power electrical train anvil. Dangerousness of this activity should be explained to the teenager either at home or school. Adult Always be careful while handling electrical equipment to avoid electrical shock injury. Make sure the socket is switch off before handling electrical system. Get help from professional personnel if unsure in handling electrical system. Avoid the usage of electrical equipment nearest to the web area. Don’t do any outdoor activities while thunderstorm. Look for protection in the building and don’t stand under the tree or closed to metal objects if need to be outdoor. The metal is not an attraction to the lightning but it can deliver the electrical current to the victim who touch them. Electrical shock recovery is depending on the type and severity of injury involve. Patients who suffer superficial burns wound will have good recovery without any problem and no need for rehabilitation. However it also depend on percentage of body surface area involve and severity of intensity. 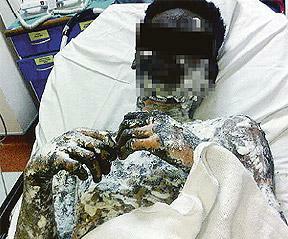 However the main cause of death in a patient who are admitted to the ward because of burns wound are due to infection. Injury to the brain either direct or indirect from electrical shock such as concussion or significant fall can cause permanent brain damage which lead to seizures, weakness or personality changes. Injury involve skeletal fracture will be treated as explain in the topic of fracture rehabilitation. Electrical injuries. In: Tintinalli JE, Kelen GD, Stapczynski JS, Ma OJ, Cline DM, eds Emergency Medicine: A Comprehensive Study Guide. 6th ed. New York, NY: McGraw-Hill; 2004: chap 201. Sumber rujukan bacaan dan gambar yang disediakan: http://www.emedicinehealth.com/electric_shock.